Schnee Sale at Gina’s Fine Gifts & Framing and Elkhart Lake Outfitters! ← Come see the Wisconsin Kiters Club on Elkhart Lake (Sat)! 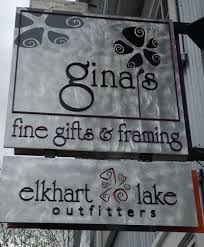 Come out this Saturday & Sunday and celebrate Schnee Days in Elkhart Lake with Elkhart Lake Outfitters & Gina’s Fine Gifts & Framing! Stop in and pick out the perfect coat, sweater, socks/shoes and/or boots to get you through the rest of this long Wisconsin winter!! 30% off select Men’s & Women’s outerwear & apparel! 30% off KEEN boots & shoes! 15% off all smartwool socks, tights and leggings! Explore our vast sale room full of marked down holiday inventory! Hope to see you all out this weekend!